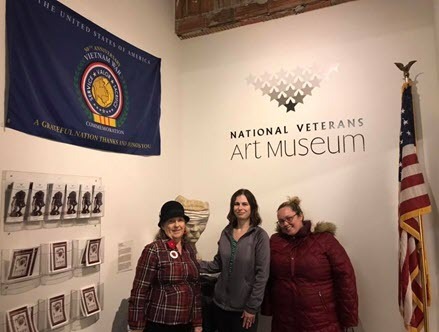 Visiting the National Veterans Art Museum on Veterans Day 2018 to reflect on art made by veterans of various eras, with particular emphasis on the Vietnam collection "The Things They Carried." Chicago Chapter commemorates events in American history locally as well as nationally. Annual events include the George Washington Birthday celebration and Constitution Week. Special events include the 50th anniversary of the Vietnam War, the 75th anniversary of the attack on Pearl Harbor, and the 100th anniversary of the Treaty of Versailles to end WWI. Chicago Chapter also requests proclamations from local and state-level government officials to remember important events in American history, such as Constitution Week and Native American Heritage Month.